Pacific Northwest Arachnids Lower surface of black and yellow garden spider from Sauvie Island, west of Portland, OR....August 22, 1994. Arachnids are characterized by 4 pairs of jointed legs and a body divided into 2 major sebments. Antennae are lacking from the head and none possess wings. Examples of arachnids found in the Pacific Northwest include spiders, harvestmen ("daddy long legs"), scorpions, mites, and ticks. Spiders are the most visible arachnids in the northwest. Spiders typically bite their prey with their long fangs, then inject a poison which subdues the victim and also starts the digestion of the victim from within. The spider then places its mouth on the victim and consumes the liquid contents. 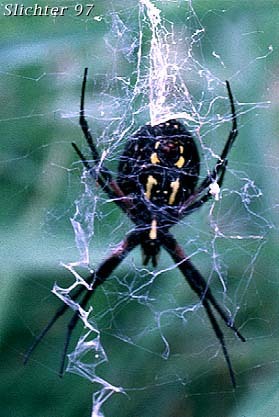 Due to popular request, more info about the black & yellow garden spider! Arachnid Links: The Arachnology Home Page- This site provides much interesting information about spiders and their relatives. 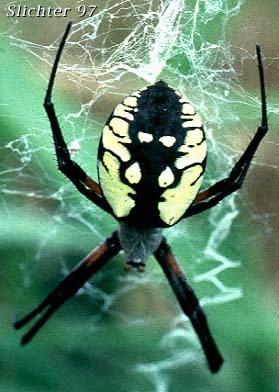 If you're in search of info about poisonous spiders or spider bites, here's the place to look! Minibeast Homepage- A site about spiders, butterflies, and insects, with educational resources.